Confidence among UK marketers continued to rise in the third quarter, with advertising budgets revised upwards at the strongest rate in nearly 13 years. The latest IPA Bellwether Report reveals a net balance of 12.3 per cent of companies registering an increase in budgets between July and September. The net balance is calculated by subtracting the percentage reporting a downward revision from that registering an upward revision. 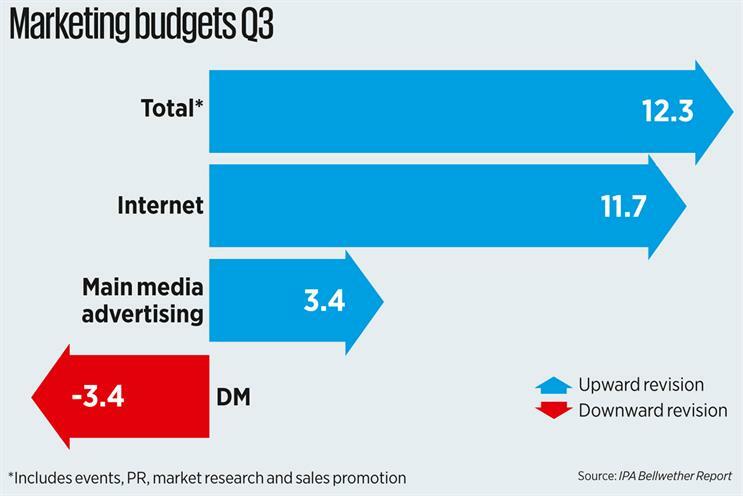 The internet recorded the biggest increase in the period (11.7 per cent), while direct marketing budgets registered the steepest decline (3.4 per cent). Traditional media advertising saw a second successive period of growth, up 3.4 per cent – the strongest since the third quarter of 2010. The findings build on the 7.3 per cent upward revision in Q2 and mean a fourth consecutive quarter of marketing budget growth. Respondents were also more optimistic about the financial prospects of their own companies than they have been for eight-and-a-half years. Paul Bainsfair, the director-general of the IPA, said the report was "a welcome boost to our industry". How should marketers approach Silicon Roundabout?